Providing Your Restaurant with the Best Serving and Cooking Utensils in the Industry. Everything that the Vollrath Company offers is considered to be the highest possible quality for the foodservice industry. From the soft spatulas to the plastic utensil caddies, everything that you put in your kitchen and on your serving tables will be the best that you can buy. Cake pans and mixing bowls are all made of material that allows the easiest preparation methods for your cooks and the easiest access for your customers at the serving tables. When your guests grab for those Vollrath stainless steel tongs to serve themselves at your stainless steel buffet, the entire set-up will give a very professional impression. Vollrath Stainless Steel Mixing Bowls - 1.5 Qt. Vollrath Soft Spoon Shaped Spatula - 9.5 in. Vollrath Plastic Spatula White - 16.63 in. Vollrath Stainless Steel Mixing Bowls - 3 Qt. Vollrath Stainless Steel Mixing Bowls - 4 Qt. Vollrath Soft Spoon Shaped Spatula - 16.5 in. Vollrath Wear-Ever Professional Small Cooling Handle - 4 in. Vollrath Stainless Steel Gravy Boat Server - 3 Oz. Vollrath Stainless Steel Mixing Bowls - 5 Qt. Vollrath Wear-Ever Professional Medium Cooling Handle - 4.5 in. Vollrath Plastic Spatula White Red - 10 in. Vollrath Stainless Steel Mixing Bowls - 8 Qt. Vollrath High Temperature Soft Spoon - 10 in. Vollrath Fuel Holder With Cover - 8 Oz. Vollrath Inset Fit Cover - 4.13 Qt. Aluminum Scoop - 24 oz. Vollrath Redco Grease White Petro Gel - 4 Oz. Vollrath Vegetable Insert Fit Cover - 7.25 Qt. Vollrath Stainless Steel Mixing Bowls - 13 Qt. Vollrath High Temperature Soft Spoon - 13.5 in. Vollrath Plastic Handle Steak Blade Knife - 4.75 in. Wear Ever Domed Cover - 8.31 in. Vollrath Stainless Steel Mixing Bowls - 16 Qt. Scoop Aluminum Nsf Approved - 40 oz. Vollrath Stainless Steel Inset and Covers - 11 Qt. Vollrath Wear-Ever Professional Standard Strength Scoop - 18 Oz. Vollrath High Temperature Soft Spoon - 16.5 in. 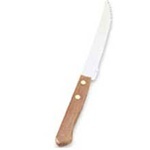 Vollrath Hardwood Handle Steak Blade Knife - 4.38 in. Cheese Cutter - 5 in. Aluminum Utility Scoop - 55 oz. Clear Squeeze Dispenser with Standard - 24 oz. Whether you need a perforated serving spoon or a one ounce ladle, you will find nothing but the best quality from the Vollrath Company line of products. As you are putting together your restaurant's list of necessary equipment, you will want to make sure that you get the kind of quality items that Vollrath has to offer. For over 100 years, Vollrath has been the name that every restaurant in the world trusts for the highest possible quality utensils. It is a name that you should trust and use to create the best possible image for your company and encourage repeat business.